You’ll probably want to set up your Pocket PC to use the same email account as your desktop PC so that you can more easily share email between the two. You can use two basic types of email with your Pocket PC: online and offline. Online (Web-based) email services typically require that you read, compose, and send messages while you’re online using a Web browser. Your Internet service provider (ISP) probably also provides you with a more traditional email account that enables you to handle your email offline. Offline email servers are also known as IMAP4 or POP3 mail servers, depending on the particular mail protocol they use. You have to select the correct mail server type when you’re setting up email on your Pocket PC, but it should be quite easy to get the server type from your ISP. The Pocket PC Inbox is primarily designed to work with the more traditional type of email account rather than with Web-based email. 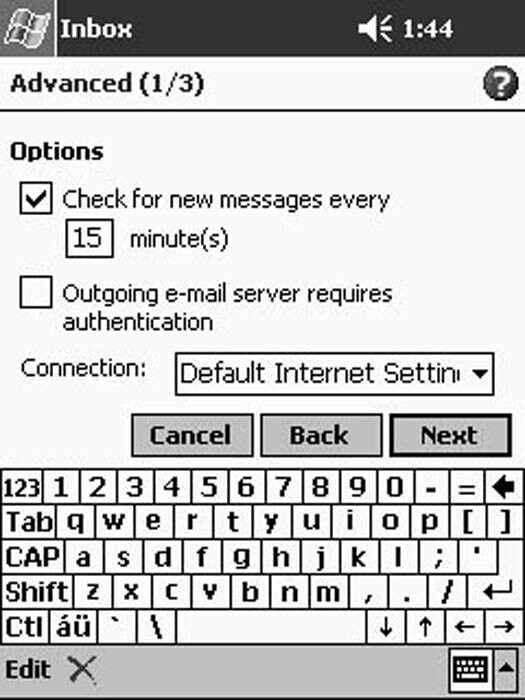 If you want to use Hotmail — an online email service — you can use the MSN Mobile link in the Mobility section of the Pocket PC Companion CD-ROM to sign up for MSN Mobile and a Hotmail account. You will then be able to use your Hotmail account just like the more traditional email services. 1. Click the Start button and choose Inbox. 2. Tap Services –> New Service on the Inbox menu bar to display the Email address screen. 3. Enter your email address in the text box. 4. Tap Next to display the Auto Configuration screen, shown in Figure 1. At this point, your Pocket PC will attempt to connect and configure itself correctly. Figure 1: Wait until the Status box says Completed before continuing. 5. Click Next to continue and to display the User Information screen, as shown in Figure 2. Figure 2: Use this screen to enter your user name and password. 6. 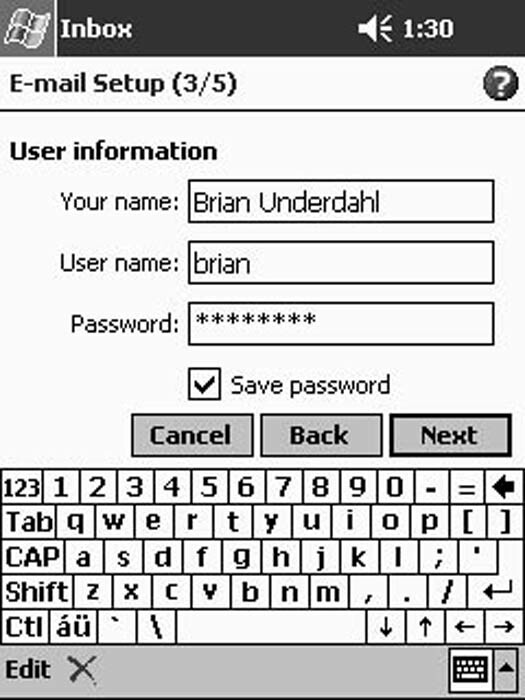 Enter your user name and password if you want your Pocket PC to be able to send and receive email automatically. If you either skip the password or don’t select the Save Password check box, you have to enter the information manually each time you want to access the mail server. 7. Click Next to display the Account Information screen. 8. In the Service type box, select the type of mail server your ISP provides. In most cases, the default POP3 is the correct choice. 9. Enter a name for this mail service in the Name box. 10. Tap Next to display the Server Information screen. 11. If the server names are not filled in, enter the correct names that were supplied by your ISP. In most cases, you won’t enter anything in the Domain box. The domain setting primarily applies if you send and receive email through a Windows NT network mail server. 12. 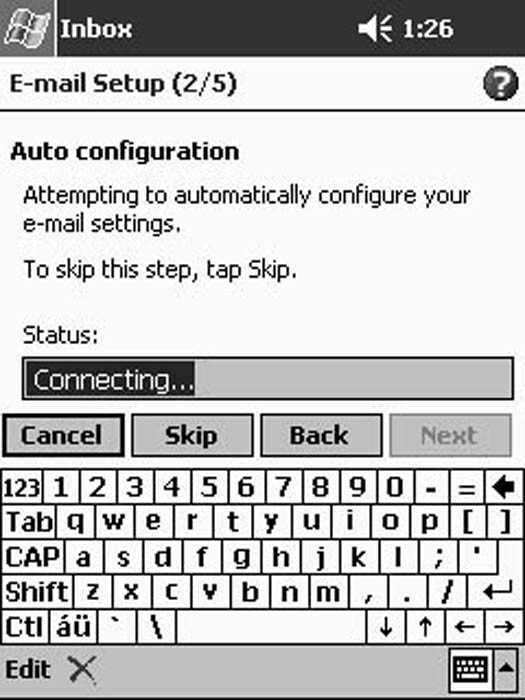 To adjust the settings for this mail server, tap Options to display the Options screen, as shown in Figure 3. Figure 3: Choose your email options. 13. Select the mail service settings that work best for you. 14. Click Next to display the next screen. 15. Choose the options to control how much of each message you want to download. If you’re using your Pocket PC as a companion to a desktop PC, you’ll probably want to accept the default settings. That way, you’re able to identify and respond to urgent messages from your Pocket PC, while your desktop PC downloads all messages completely — including any attachments. 16. Tap Next to display the final screen. 17. Tap Finish to complete the setup.